Yesterday was Ayudha puja (the 9th day of Dasara), and the day when tools and machines which are used to carry out everyday work and make a living are worshipped and blessed. I love the way Hinduism reveres and sees the divine in not only its many gods and goddesses, but also animals, and even inanimate objects! When I stepped out yesterday, I couldn’t help be reminded that it was Ayudha puja because many of the cars on the roads were decorated with banana leaves and flowers. Later on when I took the metro at Trinity station, I noticed that the entrance to the station was decorated with flower garlands. 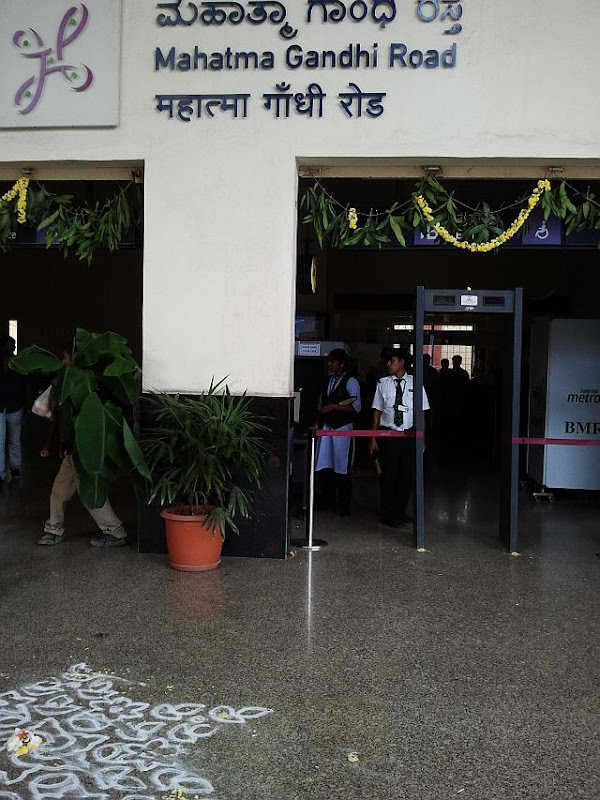 As I put my bag through the scanner, I saw that the computer screen on which the scanned objects appear was smeared with kumkum and decorated with flowers. When I reached the turnstiles, a small yellow flower had been placed delicately on each one! 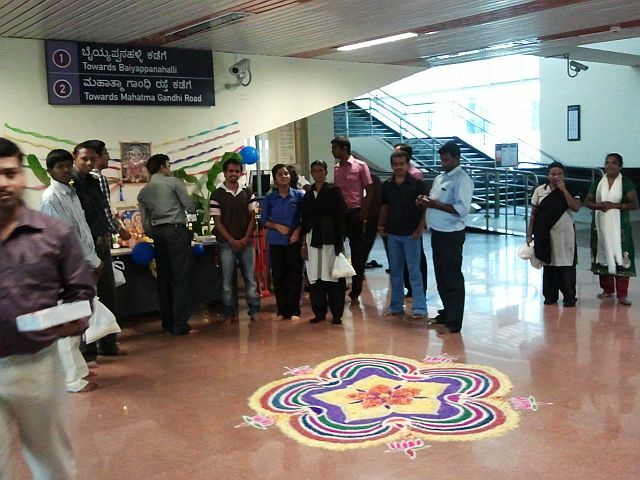 I then came across a group of Namma Metro employees celebrating this important puja day. They had made a beautiful and elaborate rangoli on the floor with flowers. A purple-shirted employee offered me prasad of fruit and sweets. Another offered me puffed rice. 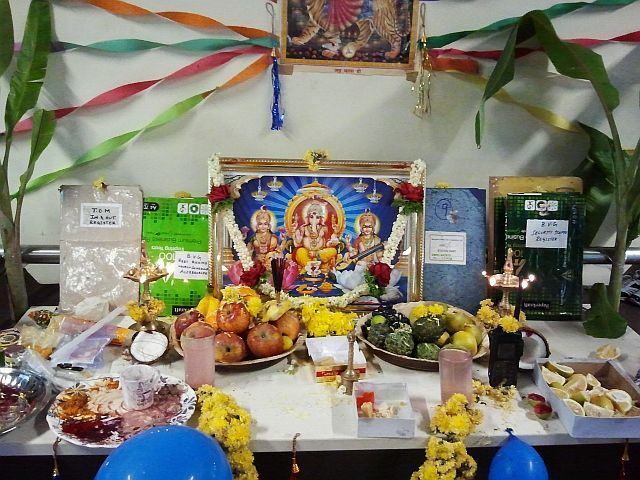 A makeshift altar was set up with pictures of deities, garlands and balloons. Notice that their log books and walkie-talkie have been properly blessed! 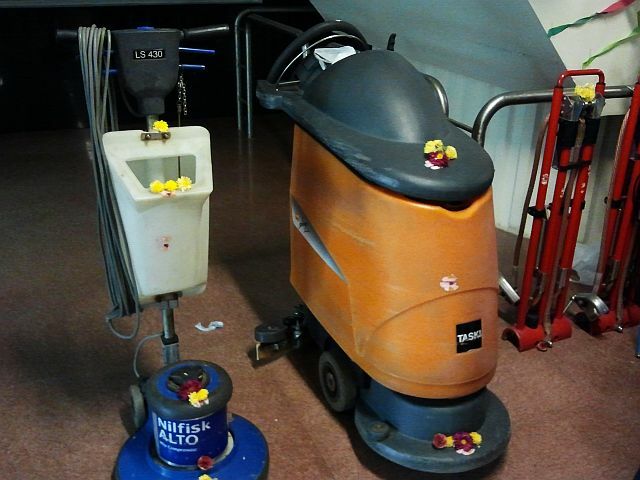 And they didn't forget the cleaning machines! I had to get a few shots of this celebration. I didn’t have my DSLR with me, so I apologise for the bad-quality photos taken with my phone! Well Veganosaurus, I was expecting a decorated train splattered with kumkum, but there was only a modest flower garland in the inside of the driver's cabin. No banana leaves stuck to the outside. Perhaps this would be a security risk! Wonderful! This is one of my favourite aspects of India too. The Rangoli is gorgeous. This is so pretty. Everything decorated beautifully. There are certain quaint little things about India you won't find anywhere else.